Everyone’s favorite mystery-solving sleuth is back, this time to embark on a whole new and even more exciting adventure with the first-ever Private Iris Special Edition entitled “The Search for the Circus Freaks.” This Special Edition gives kids a more remarkable and action-packed experience with a free flashing LED Light Stick featured in the story, awesome 3D pages that can viewed with the free 3D glasses, Private Iris Cube Art and other surprises. Even better, kids and kids-at-heart can join Iris and Danton in a unique sleuthing adventure at the launch of the Private Iris Special Edition on December 4, Sunday, 3:00 PM at Fully Booked, The Fort. Exciting activities await the kids with puzzle boards and roulette stations with lots of prizes, Build a Danton Cord cube craft; comic book reading by Private Iris creator Jamie Bautista; and the unveiling of the Private Iris Wrist guard 2.0, among others. 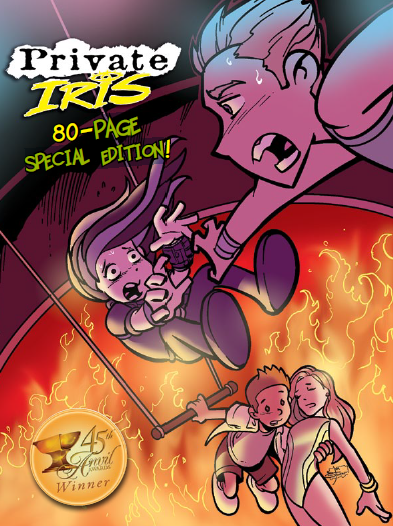 Private Iris is an Anvil-Award Winning comic book that features Private Iris and her friend Danton, following their adventures as they solve mysteries using science and interesting trivia. The series is written by Jaime Bautista and illustrated by Jim, Jay, and Joy Jimenez, creating an interesting and engaging world that teaches kids the value of saving and insurance through exciting detective stories. “The Search for the Circus Freaks” promises a more intriguing mystery as the brooding but lovable heroine Iris, with the help of her charming and popular friend Danton, investigates a chain of accidents in various circuses around the country that has been caused by a mysterious figure known only as the “Circus Freak”. When the Circus Freak threatens Uncle Sam's Flying Circus, Iris and Danton are on the case to stop it and find out who it is before another accident shuts down the circus for good. To register for the launch, just dial (632) 750-9999 or send an e-mail to promos@privateiris.com and get ready for another thrilling case with Iris and Danton. Private Iris is available in all leading bookstores. For more information: visit www.privateiris.com.